Scientists at Stanford University used underground ambient seismic waves to predict that Los Angeles will experience a strong and large ground movements if an earthquake occurs along the southern San Andreas Fault, near the Salton Sea. The Stanford scientists used weak vibrations under the Earth's core to measure and follow the movement of seismic waves. These waves are produced by the ocean waves crashing into the Earth's core. Although billions of times weaker than seismic waves generated by earthquakes, these ambient waves still follow the path an earthquake wave would. Based on their measurements, an earthquake generated seismic waves will be funneled toward Los Angeles if the southern San Andreas Fault section of California were to experience an earthquake. 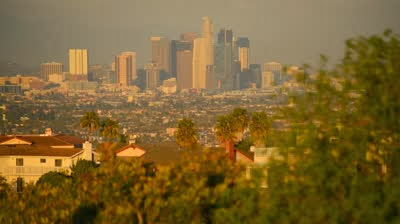 The scientists further predict that the seismic waves will be futher amplified when it reaches Los Angeles because the city sits atop a large sedimentary basin. Stanford scientists are using weak vibrations generated by the Earth's oceans to produce "virtual earthquakes" that can be used to predict the ground movement and shaking hazard to buildings from real quakes. The new technique, detailed in the Jan. 24 issue of the journal Science, was used to confirm a prediction that Los Angeles will experience stronger-than-expected ground movement if a major quake occurs south of the city. "We used our virtual earthquake approach to reconstruct large earthquakes on the southern San Andreas Fault and studied the responses of the urban environment of Los Angeles to such earthquakes," said lead author Marine Denolle, who recently received her PhD in geophysics from Stanford and is now at the Scripps Institution of Oceanography in San Diego. The new technique capitalizes on the fact that earthquakes aren't the only sources of seismic waves. "If you put a seismometer in the ground and there's no earthquake, what do you record? It turns out that you record something," said study leader Greg Beroza, a geophysics professor at Stanford. What the instruments will pick up is a weak, continuous signal known as the ambient seismic field. This omnipresent field is generated by ocean waves interacting with the solid Earth. When the waves collide with each other, they generate a pressure pulse that travels through the ocean to the sea floor and into the Earth's crust. "These waves are billions of times weaker than the seismic waves generated by earthquakes," Beroza said. Scientists have known about the ambient seismic field for about 100 years, but it was largely considered a nuisance because it interferes with their ability to study earthquakes. The tenuous seismic waves that make up this field propagate every which way through the crust. But in the past decade, seismologists developed signal-processing techniques that allow them to isolate certain waves; in particular, those traveling through one seismometer and then another one downstream. Denolle built upon these techniques and devised a way to make these ambient seismic waves function as proxies for seismic waves generated by real earthquakes. By studying how the ambient waves moved underground, the researchers were able to predict the actions of much stronger waves from powerful earthquakes. She began by installing several seismometers along the San Andreas Fault to specifically measure ambient seismic waves. Employing data from the seismometers, the group then used mathematical techniques they developed to make the waves appear as if they originated deep within the Earth. This was done to correct for the fact that the seismometers Denolle installed were located at the Earth's surface, whereas real earthquakes occur at depth. In the study, the team used their virtual earthquake approach to confirm the accuracy of a prediction, made in 2006 by supercomputer simulations, that if the southern San Andreas Fault section of California were to rupture and spawn an earthquake, some of the seismic waves traveling northward would be funneled toward Los Angeles along a 60-mile-long (100-kilometer-long) natural conduit that connects the city with the San Bernardino Valley. This passageway is composed mostly of sediments, and acts to amplify and direct waves toward the Los Angeles region. Until now, there was no way to test whether this funneling action, known as the waveguide-to-basin effect, actually takes place because a major quake has not occurred along that particular section of the San Andreas Fault in more than 150 years. The virtual earthquake approach also predicts that seismic waves will become further amplified when they reach Los Angeles because the city sits atop a large sedimentary basin. To understand why this occurs, study coauthor Eric Dunham, an assistant professor of geophysics at Stanford, said to imagine taking a block of plastic foam, cutting out a bowl-shaped hole in the middle, and filling the cavity with gelatin. In this analogy, the plastic foam is a stand-in for rocks, while the gelatin is like sediments, or dirt. "The gelatin is floppier and a lot more compliant. If you shake the whole thing, you're going to get some motion in the Styrofoam, but most of what you're going to see is the basin oscillating," Dunham said. As a result, the scientists say, Los Angeles could be at risk for stronger, and more variable, ground motion if a large earthquake – magnitude 7.0 or greater – were to occur along the southern San Andreas Fault, near the Salton Sea. "The seismic waves are essentially guided into the sedimentary basin that underlies Los Angeles," Beroza said. "Once there, the waves reverberate and are amplified, causing stronger shaking than would otherwise occur." Beroza's group is planning to test the virtual earthquake approach in other cities around the world that are built atop sedimentary basins, such as Tokyo, Mexico City, Seattle and parts of the San Francisco Bay area. "All of these cities are earthquake threatened, and all of them have an extra threat because of the basin amplification effect," Beroza said. Because the technique is relatively inexpensive, it could also be useful for forecasting ground motion in developing countries. "You don't need large supercomputers to run the simulations," Denolle said. In addition to studying earthquakes that have yet to occur, the technique could also be used as a kind of "seismological time machine" to recreate the seismic signatures of temblors that shook the Earth long ago, according to Beroza. "For an earthquake that occurred 200 years ago, if you know where the fault was, you could deploy instruments, go through this procedure, and generate seismograms for earthquakes that occurred before seismographs were invented," he said.